Calcium deposits on the face appear as small, firm, white bumps on the skin. They develop when excess amounts of calcium phosphate are deposited in the skin. 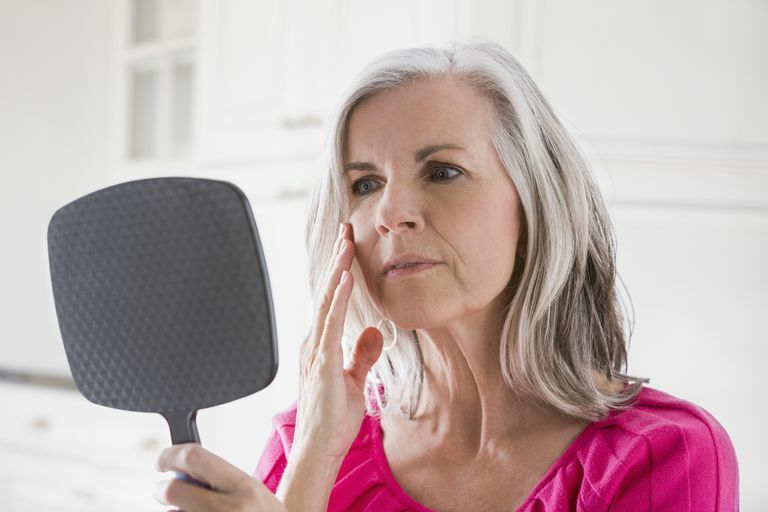 This can happen for a wide variety of reasons, including skin injury, connective tissue or autoimmune disorders, kidney problems, or due to certain medications. The medical term for calcium deposits is calcinosis. Calcium deposits that appear on the skin are specifically called calcinosis cutis. Calcium deposits can develop anywhere on the skin, although they tend to be most common on the fingertips, around the elbows and knees, and on the shins. Calcium deposits can develop in other tissues of the body as well. Your body uses calcium phosphate (a compound of calcium and phosphorus) to build healthy teeth and bones. Calcium also helps your muscles to contract and relax, your blood to clot, and your nerves to function properly. Calcium is a very important mineral. But when calcium and phosphorus levels are abnormal, due to a host of different reasons, calcium deposits can form. Calcium deposits are white, sometimes slightly yellowish, colored lumps or bumps under the skin. They can be various sized, and often develop in clusters. These bumps most often develop slowly over time. Some people notice a slight bit of itching or redness before the bumps actually appear, but most people don't have any symptoms before the calcium deposits form. The most common place to develop calcium deposits is the elbows, fingertips, and the front of the legs, although they can develop anywhere on the body, including the face. Often they don't hurt or bother you in any way (besides cosmetically) especially when they're on the face. When calcium deposits occur in other areas of the skin, like around the joints, they can be painful though. If calcium deposits split open (ulcerate) or if they're punctured a semi-solid, pasty material may drain out. Calcium deposits on the face develop when an excess amount of calcium phosphate gets deposited in the skin. They don't have one specific cause, but rather many different issues can trigger the development of calcium deposits. Injury or Infection of the skin is the most common cause of calcium deposits. Called dystrophic calcinosis cutis, with this type of calcium deposit calcium and phosphorus levels in the body are normal. But when the skin has been damaged in some way, and cells die off, they release proteins that bind with phosphates, leading to calcification in the skin. Dystrophic calcinosis can develop because of acne, panniculitis, burns and and other skin trauma. This type of calcinosis is also associated with some autoimmune and connective tissue diseases like lupus, scleroderma, rheumatoid arthritis, and Sjogren syndrome. Certain medications and medical procedures can cause a type of calcinosis called iatrogenic calcinosis cutis. Any medications that raise the calcium or phosphorus levels in your body can make you more likely to develop calcium deposits. Calcium deposits can also appear at the site of an invasive procedure, post surgery for example, or on a newborn's heel after repeated heal sticks. Medical conditions that cause cause abnormal amounts of calcium or phosphorus trigger a form of calcium deposits called metastatic calcinosis cutis. The most common cause is chronic kidney disease. Other causes include hyperparathyroidism, tumors, sarcoidosis, excess vitamin D levels, and milk-alkali syndrome. Sometimes calcium deposits develop for no apparent reason at all. When calcium and phosphorus levels are normal, and there are no underlying medical conditions, yet calcium deposits still develop, it's called idiopathic calcinosis. This type of calcinosis isn't as common as the others. Since they can be a sign of an undiagnosed medical condition, it's important to get yourself checked over by a physician if you think you have calcium deposits. Your physician will first do a visual inspection of your skin. Not all white bumps on the skin are calcium deposits. What you think are calcium deposits may be something entirely different. If needed, a biopsy can be done to positively diagnose calcium deposits. If you do indeed have calcium deposits, your calcium, phosphorus, and vitamin D levels will be checked. You physician may also check to see if your thyroid and kidneys are functioning properly, and possibly test for systemic diseases that cause calcium deposits. Milia are small, firm, white bumps that also develop on the skin. They look remarkably similar to calcium deposits; so much so that they are often mistaken for calcium deposits by those who develop them. To add to the confusion, many people use the terms "milia" and "calcium deposits" interchangeably. But milia and calcium deposits develop differently and have very different causes. Milia are tiny cysts that that form when a small bit of keratin becomes trapped under the surface of the skin. They are especially common on the face, around the eyes and forehead. Milia are completely harmless, and aren't caused by any underlying medical problem. Milia are by far more common than calcium deposits, especially on the face. All the more reason to have your physician take a look at any unidentified white bump you have, on the face or otherwise. You must get the correct diagnosis in order to get the correct treatment. Because there are so many different underlying causes for calcium deposits, there are also many different types of treatments. Calcium blockers, like diltiazem, amlodipine, and verapamil, are the most commonly prescribed medications for treating calcium deposits. Calcium blockers lower the amount of calcium that can be taken up by the skin's cells. Warfarin, colchicine (an anti-inflammatory), and prednisone (a steroid) are sometimes prescribed as well. These medications can help shrink the calcium deposits. There are medical procedures that can be done to treat calcium deposits as well. Surgical excision is a procedure that is done to physically remove calcium deposits from the skin. Laser therapy uses light or carbon dioxide to dissolve the calcium deposits. Iontophoresis can be used to dissolve calcium deposits as well, by using weak electric current to deliver medication directly to the calcium deposits. Even with these procedures though, calcium deposits can reoccur. To get the best long term results you need to treat the root cause. Treating any underlying disease causing calcium deposits will, by default, help treat calcium deposits too. There may be other treatments available that are options for you. Your doctor will help decide which is the best treatment for your particular situation. White bumps on the skin, can be upsetting, but especially so when they appear on an area as obvious as your face.Don't assume any white bump on the face is a calcium deposit, though. There are many causes of bumps on the skin besides calcium deposits. If you have any unidentified bump on the skin, have it checked out by a physician. Your healthcare provider can then help you develop a plan to treat your calcium deposits, and any other underlying medical problem you may have. Reiter N, El-Shabrawi L, Leinweber B, Berghold A, Aberer E. "Calcinosis Cutis: Part I. Diagnostic Pathway. "Journal of the American Academy of Dermatology. 2011 Jul;65(1):1-12. Le C, Bedocs PM. "Calcinosis Cutis." In: StatPearls [Internet]. Treasure Island (FL): StatPearls Publishing; 2018 Jan-. Valenzuela A, Chung L. "Calcinosis: Pathophysiology and Management." Currenty Opinion in Dermatology. 2015 Nov;27(6):542-8.